FOR BEST RESULTS rototill or spade the area to loosen compacted soil. There should be 4 to 6 inches of good soil under the sod, see how much is existing, then add additional soil. Sod laid on compact, infertile soil will not be successful. To ensure good drainage, grade soil to slope slightly away from the house or other buildings. Eliminate bumps or high spots where a mower might cut the grass too short, and fill in any low spots where rainwater tends to collect. Rake and smooth the soil, removing rocks, roots, and other debris. Roll the area lightly with a roller 1/3 full of water to firm the soil surface. 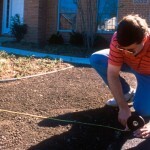 TO LAY THE SOD locate a straight line, such as a curb or driveway, and establish the first row. Stagger the joints in each row in a brick like fashion. Make sure all joints are butted tightly together without overlapping or stretching. Avoid leaving small pieces at outer edges as they will not retain moisture. On slopes, place sod across the slope and stake if necessary. After installing the sod, roll the entire area to improve sod/soil contact and to remove air pockets. SOD IS A LIVING PLANT that requires ground contact and moisture to survive. If it is not possible to lay the sod with 8 hours, stack the sod in shade and sprinkle it occasionally. FIRST WATERING should be to a depth of one inch. Water daily, or more often, keeping sod moist until it is firmly rooted (about 2 weeks). Then less frequent and deeper watering should begin. Watering bans do not apply to new sod. Water areas near buildings and driveways more frequently where reflected heat dries the sod. Avoid heavy use during the first three weeks to allow the roots an opportunity to firmly knit with the soil and to avoid depressions. Please refer to our Watering page for more information.